The “fabulous Southern Cambria, dread of the timid traveler,” is a story of a transit line that tried to conquer the tortuous terrain of the Alleghenies. Extending from Johnstown to Nanty Glo, South Fork, and Ebensburg, the line was plagued by numerous accidents, the most tragic of which was the head-on crash of two trolleys on August 12, 1916. Twenty-seven lives were lost and 80 injured. The Southern Cambria continued operating until December 17, 1928. Northern Cambria began operations between Barnesboro and Patton, extending to Carrolltown in 1907. The company was sold at foreclosure in 1918 and reorganized as the Northern Cambria Railway Co., operating until July 31, 1926. The company was forced to discontinue service due to the reconstruction of U.S. Route 219, an action which would have required the relocation of the company’s rail track. The company decided to close instead. The South Fork-Portage Company was originally chartered as the Johnstown & Altoona Railway Co. with the intention of connecting the two cities by rail. But money problems narrowed the vision to a three mile trolley line between South Fork and Summerhill. In 1918, the company failed and reorganized as the Penn Central Railway Co. with the goal of extending the line to Portage. Numerous derailments resulted in the termination of the company in 1928. Organized to provide trolley service from Johnstown to Somerset, the company was limited to providing service between the Somerset County communities of Kelso, Hollsopple, and Jerome. Johnstown passengers rode the Johnstown Traction Co. line to Kelso and transferred to the J & S Railway line. In October of 1922, direct service was provided between Johnstown and these communities. Automobile competition lead to the failure of the company in 1931. Originally formed as a rail line in 1904 to haul logs from Rexis (near present-day Vintondale) to northern forests, the company began passenger service in 1911 and extended service east of Colver and north of Pine Flats in Indiana County. In 1914, service began to Nanty Glo and Revloc. Only one trolley was used on the line, a Brill Company car capable of running on either overhead line current or self-contained batteries. Service was discontinued on May 31, 1925, when the Brill car met a steam locomotive head on. Originally formed to provide horse car service in the Johnstown area. After the Flood of 1889, the system was electrified. By 1907, the company operated 110 trolleys over 31 miles of track. After a major accident in 1909, the company reorganized as the Johnstown Traction Co. By 1943, the Traction Company was carrying over 17,000,000 passengers a year. Thereafter, ridership declined due to the growth of the automobile industry. On June 11, 1960, all rail operations were halted and converted to either trackless trolleys or buses. All trackless trolley operations were discontinued in November 1967. The Traction Company continued operating buses until December 1, 1976, when service was provided under a lease agreement with the newly created Cambria County Transit Authority. The Authority purchased all assets of the company the following year and the Traction Co. was dissolved. Cambria County Transit Authority was officially started in 1976. In 1978, Cambria Area Rural Transit (CART) was formed in the northern end of the county. By 1983, CCTA had officially acquired the Johnstown Inclined Plane from Westmont Borough, and the places were set for what would become CamTran’s trifold of services. 1983 was also a year of restoration, and CCTA built their Transit Center in downtown Johnstown. From 1980 to 1989, the Inclined Plane underwent major renovations. By 1989, the visitors’ center had been built along with the James Wolfe Sculpture Trail and the flag atop the mound, which is the largest free-flying flag in the United States. In 1992, CCTA introduced a countywide paratransit service that still exists today. In 1994, we constructed the pedestrian crosswalk at the bottom of the Incline. By 1999, it was time to update our image, as we changed our colors to blue and purple and renamed ourselves CamTran, following a contest to rename our authority. The year 2000 saw a lot of updates from CamTran. We added the park and ride service from Ebensburg to Johnstown, began our Sunday service, and introduced Reserve-A-Ride. By 2002, the rural division was rebranded as CamTran+, symbolizing the additional services that the rural division provides, such as ADA, Reserve-A-Ride, and the Persons with Disabilities program that would be introduced in May of 2008. We built a new transportation center for CamTran+ in Ebensburg in 2003 and did a major revision of our rural routes, introducing the Ebensburg-Altoona commuter route. In 2005, we reopened the Incline to a daily schedule, remodeled the visitors’ center once again, and opened the new restaurant atop the Inclined Plane. We expanded the parking atop by 30 spaces, allowing for more groups to comfortably enjoy the area. 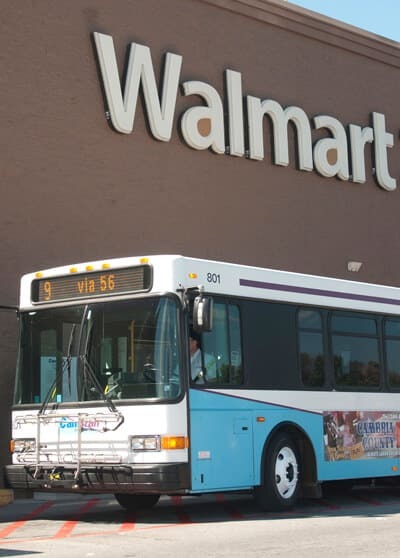 In 2006, we installed bike racks on all of our urban division buses and one large bus in the rural division. These racks are gaining in popularity among all age groups. 2006 was also the first year in awhile that the Incline reached over 100,000 riders. In July, CamTran celebrated its 30th anniversary. By 2008, CamTran had completed renovations to its downtown transit center, improving air quality, making transfers more fluid for riders with electronic departure signs, and adding two new buses with cleaner burning engines. 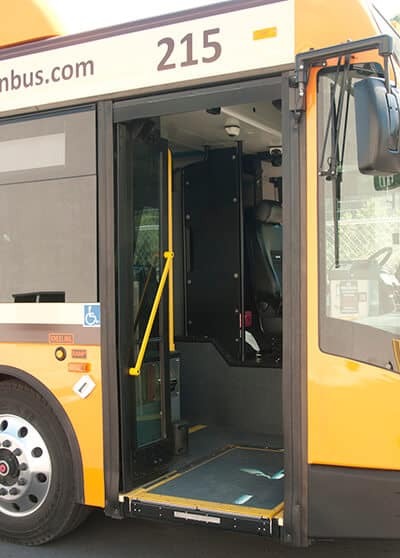 In May, CamTran+ added the Persons with Disabilities program, which offers a discounted fair to persons with qualifying disabilities on our door-to-door services. October 28, 2014 marked an important day for public transportation in Cambria County. CamTran opened its new administration, operations and maintenance facility. This new facility is located at 502 Maple Avenue in the Woodvale section in Johnstown, PA. It has been 121 years since the last administration, operations and maintenance facility was built in Cambria County. It was important to CamTran to remain in the City of Johnstown. We are able to stay within the City limits due to the generous donation of land by Smith Industries. We are thrilled to say that this new office facility will take us forward into the next century. As a result of the support of former Congressman Mark Critz; Senator Bob Casey, Jr.; State Senator John Wozniak; State Representatives Bryan Barbin, Frank Burns and Gary Haluska; and County Commissioners Doug Lengenfelder, Mark Wissinger and Tom Chernisky; as well as former County Commissioners P.J. Stevens, Milan Gjurich and Sam Valenty in matching the federal and state funds, CamTran was able to build a new state of the art facility. This project was funded through the generous contribution of the Federal Transit Administration, the PennDOT Bureau of Public Transportation and at the local level by the Cambria County Commissioners and the Johnstown Redevelopment Authority. One of the many reasons why one may choose to ride public transportation is to reduce the carbon footprint vehicles have on the environment. CamTran envisioned this goal as well, which is why, as of May 29, 2015, we now have a CNG (compressed natural gas) bus in our fleet. The new bus is a 29-foot, low-floor CNG heavy duty bus. This CNG bus releases fewer carbon emissions than a common car. CamTran is proud to say that this bus is truly making a difference for our environment. Not only does the CNG bus improve the air quality, but it also uses alternative fuel, which keeps costs low for our customers. Our CNG bus operates in both rural and urban divisions. CamTran officials thanked the following elected officials for their support of clean air technology in public transportation, Cambria County Commissioners Lengenfelder, Wissinger and Chernisky, State Representative Bryan Barbin, State Senator John Wozniak, Congressman Keith Rothfus and Senator Bob Casey, Jr. It was through their support and federal, state and local funding that CamTran was able to receive their first compressed natural gas bus. In addition, PennDOT announced this summer that CamTran will be the first of PennDOT’s P3 projects to have a Compressed Natural Gas (CNG) public/private fueling station built on our property. By opening the CNG fueling station, CamTran is making a conscious decision to operate more efficiently and provide residents and businesses of Cambria County the opportunity to utilize the more cost effective and environmentally friendly fueling station.